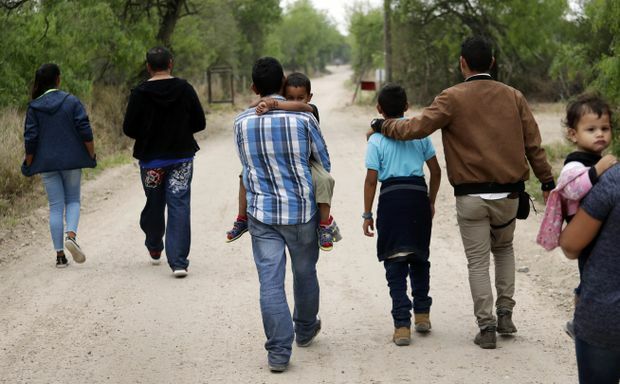 A group of migrant families walk from the Rio Grande, the river separating the U.S. and Mexico in Texas, near McAllen, Texas on March 14, 2019. Trump’s signature solution – and the reason for his declaration of a national emergency – is a border wall, especially in South Texas, where there are comparatively few barriers. But a border wall would not stop families who aren’t trying to evade immigration authorities. Those families typically stop after crossing the Rio Grande and wait to be caught. After crossing the border, Romero said they were taken to a smaller Border Patrol station – what she and other Spanish-speaking migrants often refer to as “la hielera,” or the icebox. She said another woman in custody lent her a sweater so she could keep Cesar warm because agents had taken many of her belongings.